I’ve got a weird relationship with this Sanderson guy, the remarkably prolific, super popular fantasy author known for his robust magic systems. Ben, who you’ll know from the podcast, is a huge fan of Sanderson’s work and for a long while kept trying to get me to read the mammoth Stormlight Archive trilogy. I finally gave it a shot and got about two chapters in before quitting in frustration because Sanderson kept throwing out name after name like he was expecting me to either know who these people were or the significance of these places when I have literally no context to understand any of it! Then I tried one of Sanderson’s YA books but also quit after a couple of chapters because it was dull. Finally I gave him one more shot with Mistborn and got hooked. 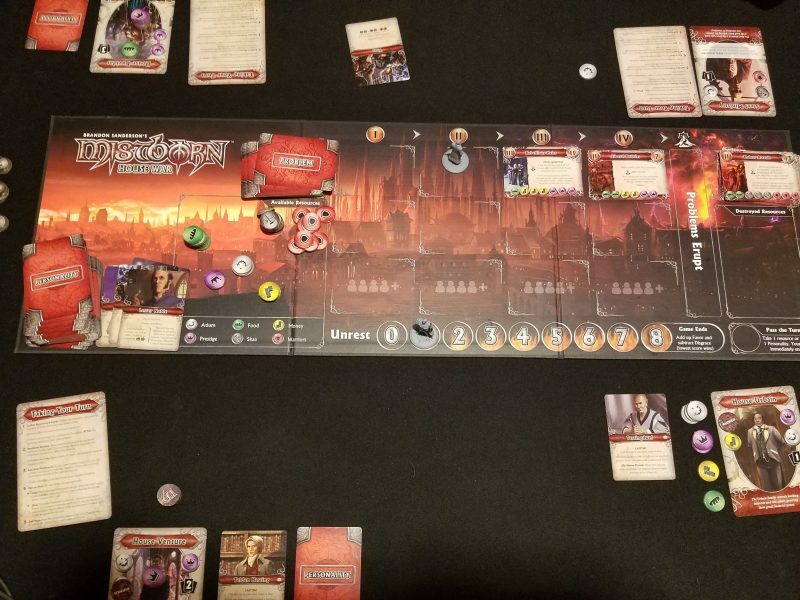 The first book, which provides the setting for Mistborn: House War, from Crafty Games and Kevin Wilson is a compelling story about an attempted rebellion to overthrow a seemingly immortal ruler in a world where ingesting metals can provide magical powers and most of the population is enslaved. Then the second and third books blow open the world metaphysically and go places I never expected. Then there’s a second series that might be better than the first! In short: I recommend the books. They’re not the best I’ve ever read, but they’re undeniably fascinating and entertaining. 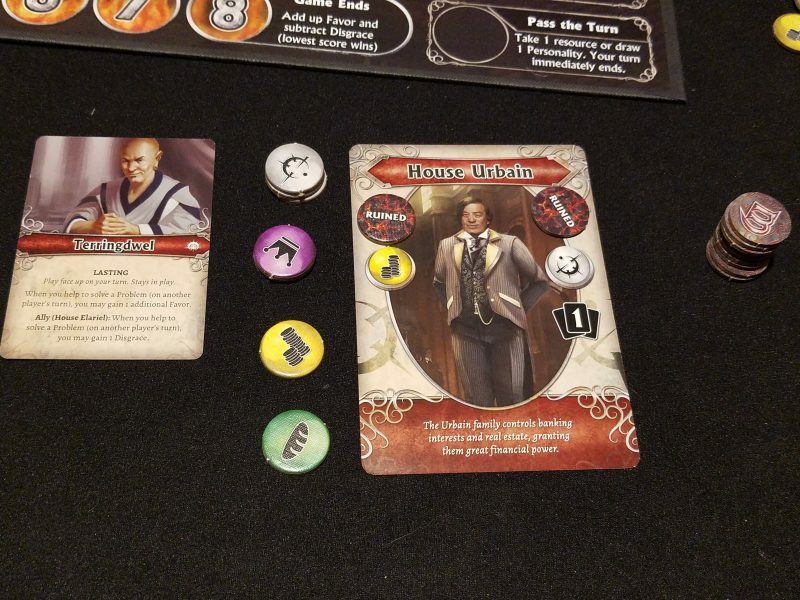 The Mistborn game has the players acting as the various great houses that constitute the world’s nobility class. They’re scheming, evil, manipulative people, and in this game you’re certainly going to do a lot of manipulation. The mechanical premise is intriguing: a semi-cooperative game of sorts where everyone is trying to manage a series of collective problem cards while individually getting the most points. And honestly that’s about it. Each person gets a certain amount of income of various resources and cards, and every turn the problem cards slide down a track toward their eventual eruption where they cause, usually, a negative effect to one or more people. The most clever part of the game is how you can manipulate the progression of these cards to benefit yourself. As part of your turn you have to shift each problem forward once, but you can choose the order in which they shift. If a column in the problem track is full and a card needs to shift onto it, you jump to the next available column. If there are enough problems on the board you can use this to advance cards very quickly, perhaps causing a chain of eruptions on your turn. “Now why on earth would you want to erupt problems on your turn? I love you, Marc, you handsome board game genius, but that doesn’t make a lot of sense”, you might be asking. Dear reader: I love you too. And the reason you’d want to do that is because whenever a problem is erupted on your turn, you choose to whom it applies. If the effect is unrest, which affects everyone equally, that may not matter. But if the eruption effect is that one person gets five disgrace (essentially negative victory points), you want to pin that on your nemesis across the table. Getting the opportunity to do that is hilarious, as it inevitably changes the dynamics at the table in potentially unpredictable ways. In a negotiation game in which you’re going to need the help of everyone at some point in the game, grudges can be self-defeating. But, I mean, we’re only human. People gonna grudge. And if Mistborn works as a game it’s when the participants get into the negotiations and deal-making and bad blood and accusations and all that goodness that can come about whenever a game says “hey, just talk it out”. Sadly there aren’t a lot of opportunities to do so in a 4-player game. With 3 players you reduce the size of each column, which allows for enough problem card traffic to make it happen, and with 5 players there are enough on the board for it to sometimes be an option. But I’ve gone through an entire 4 person game before without anyone ever having the chance to manipulate the problems. Given that it’s one of the best parts of the game, that’s extremely disappointing. Semi-coop negotiation games are going to either be your thing or not, and I think I like them alright? Okay, that sentence was literally self-contradictory, but I do like that style of game in theory. In practice it’s very hard to do well. Churchill might be the best example of this genre, and epics like Twilight Imperium do the free-for-all diplomacy thing right. Archipelago might be the closest comparison to Mistborn, and even though it has some glaring faults, there is a lot more game housed in Archipelago’s tropical-colored box. Mistborn, on the other hand, has very little game other than the negotiation, and then too much of it. It’s a 45 minute game stretched out to over 2 hours. Each of the problems, when solved, gives a certain number of points, and whoever is attempting to solve that problem can promise a cut of that pie if others contribute, among other things. The rules for negotiations are fairly loose, and the rulebook encourages house-ruling to fit your group. I wouldn’t normally be a fan of that kind of rules looseness sanctioned by the powers that be, but I think it’s fine here in a game that is so dependent on the negotiation clicking with the playing group. We played by the rules as given and found it to be clear and reasonable. That said, negotiations in games should be tense, exciting, and impactful. Ideally they should concern everyone playing the game. Mistborn is hit and miss in this regard. Frequently players will not be able to contribute anything to the problem since they’ll be out of resources, making the entire process completely uninteresting from their perspective. In theory they can try to manipulate the terms of whatever deal the other players are working on, but we haven’t found that to be a factor given that in most situations everyone’s simply trying to maximize their personal points and not collude with others. But more problematically the negotiations simply aren’t very tense or exciting. In Archipelago the common problems are entirely problems. Until you get to the one that’s going to cause everyone to lose there’s an incentive to just let it slide–the crises accelerate until you get to the brink of losing because it’s the tragedy of the commons ported directly to a game. 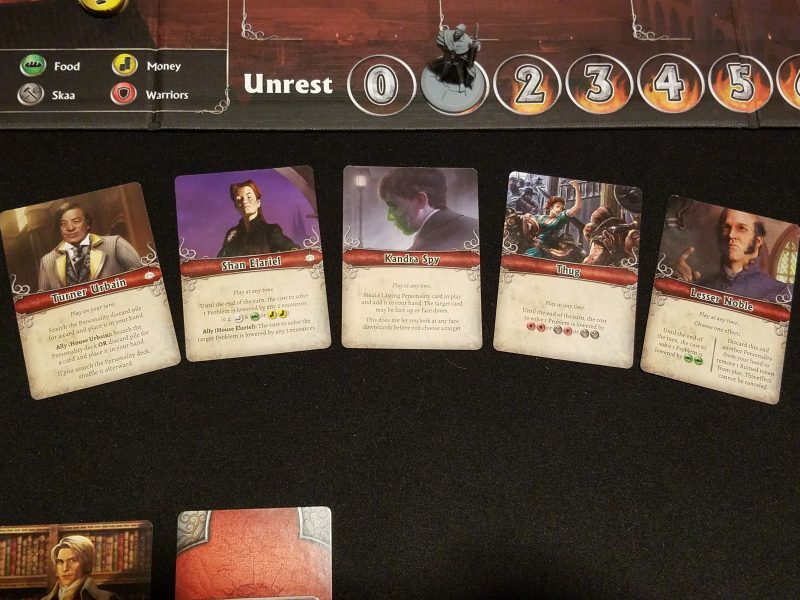 In Mistborn the problems are problems, yes, but they’re also the primary method of gaining victory points. So while you may decide to make a few problems slide because the consequences aren’t that bad, it’s mostly to instead prioritize solving a problem that will give you more points. Instead of being a game about managing problems effectively, Mistborn ends up being a game about trying to get the most return for your resources. There are two notable exceptions to this. The beginning of the game has the group flooded with problems on the board, and if you get a couple of nasty ones it can be quite a panic to try to deal with them before you get into an even worse situation. The end of the game is interesting because everyone starts thinking entirely in the short term. They let problems go by that they might have been concerned about earlier in the game. Most critically everyone starts to navigate the conceptually interesting endgame. There are three ways for the game to end. One of the problems in the deck is Vin, the main protagonist from the novel. Vin can either erupt or be solved to end the game, in which case the person who has the highest number of points wins the game. If unrest ticks up to 8, through any means (including Vin erupting), then the game ends and the person with the fewest number of points wins. Intrigue! When I first read this part in the rulebook I was excited to see how it would play out. You may be noticing a theme in this review–a cadence, if you will, of interesting concepts with flawed executions. We’re not breaking the pattern here. I love the idea of an alternate win condition if you can affect the common problems enough. Plus it’s super thematic. In the book the houses don’t necessarily care that much if the Lord Ruler is overthrown, only that their own interests are upheld. So someone going for the unrest victory is hedging on the rebellion being successful and coming out on top in the aftermath. With the exception of two player collusion in a 5 player game I don’t know if people have enough influence over the amount of unrest created to commit to this strategy from the beginning. In the first game I played there were three of us and one of the players tried to push unrest. Once the other two of us figured out what he was doing, we just took care to make sure we didn’t create any unrest and were able to handle problems well on our own. The other guy had no chance. What instead tends to happen is that the players who think they’re behind pivot towards the alternate win condition in the latter half of the game, hoping that they can do enough to make it happen. Which brings us to the cards. Other than accelerating the problem cards, which is inconsistent at best, the main way to influence your schemes other than some truly brilliant negotiation is with the personality cards. These are effectively action cards and they turn Mistborn into a “take that!” game as much as it is a negotiation game. Take that as a mechanism is anathema to a lot of modern board game players due to the fact that it can punish players through no fault of their own. In a fiercely competitive game it can be infuriating to have your efforts thwarted by a card in someone else’s hand that you couldn’t have foreseen. It’s a tricky design issue, but I’m not that much of a snob and can recognize that take that isn’t necessarily a problem. In Mistborn it works alright. The cards follow general themes so even after a couple of games you get a good idea of what you’ll see from the deck, even if you don’t know the specifics. That helps reduce the amount of uncertainty and complete surprise you’ll see from any take that plays against you. You can offer to play cards from your hand as part of a negotiation, which we probably underutilized in our games. I can see that becoming more prominent in our deal-making as we play more because the cards can be so powerful. My biggest frustration in this game might be with the cards, though, because there are a handful of cases where one card is strictly better than another. There are a few cards that can reduce the resource threshold by two specific resources, for instance. But there are also a couple of cards that can reduce the resource threshold by any two resources. When you have a randomizing element like a deck of cards, why would you make it more variable by making some card draws strictly better than others? Obviously it’s difficult to balance power levels across different card effects but this isn’t a situation where a particular interaction ended up being more powerful than others. Some cards in Mistborn are just better by design. Time after time I’ve been baffled to see someone pull out a card that is just a better version of a card I have in hand. 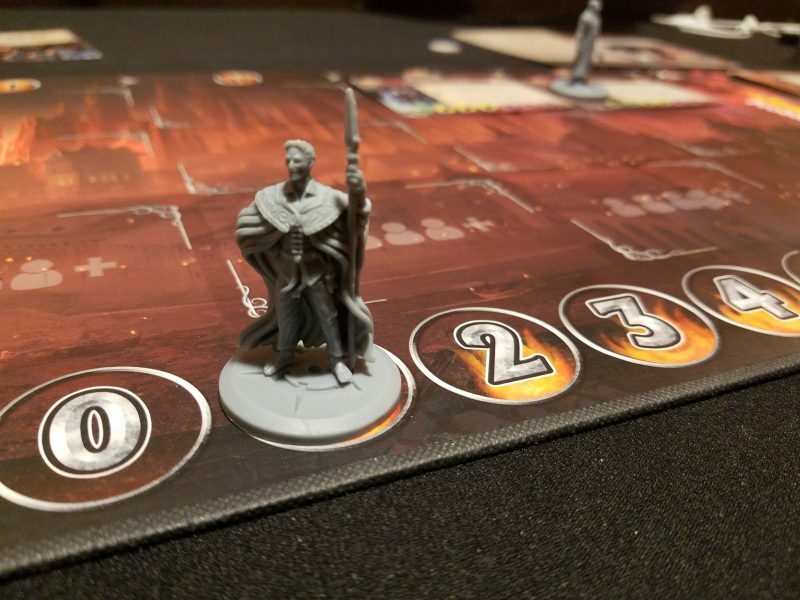 The story remains consistent: Mistborn is a game with some interesting ideas executed inconsistently. It’s a negotiation game with a big lull in the middle where negotiations become dull. It’s a take that game with frustratingly variable cards. It evokes the uneasy alliances and bickering between the great houses in the Mistborn books without evoking any of the real danger of the rebellion. It’s a light and accessible game that drags on over two hours. That’s not to say it’s horrible. I’ve had some good times with Mistborn. Blocking someone from gaining points and feeling their wrath for the next twenty minutes is hilarious. Arguing over the distribution of a single point in a heated negotiation is compelling. Strategically pivoting to try to make the rebellion succeed at the end of the game can be thrilling. But there aren’t enough of these moments compared to the doldrums to make it a compelling experience.